Persistence Market Research (PMR) analyzes the global cutting equipment market in a new publication titled “Cutting Equipment Market: Global Industry Analysis 2012–2016 and Forecast 2017–2025”. This study provides data for 2016 along with a forecast for the period 2017–2025. The main objective of the report is to identify dynamics in the market and provide recent updates and insights affecting various segments of the global cutting equipment market along with related consumables and accessories. To provide better understanding of the market, the report also includes an analysis of drivers, restraints, and trends in all five regions namely, Asia Pacific, North America, Europe, Latin America and the Middle East & Africa, which influence the current market scenario and future status of the global cutting equipment market over the forecast period. To understand and assess market opportunities and trends, the global cutting equipment market report is categorically split into different sections based on market segmentation – by equipment type, by cutting technology, by end use, by type, and by region. The report starts with the market overview and provides market definition and taxonomy along with value chain analysis, region wise pricing analysis, and the various drivers, restraints, and trends impacting the market. The sections that follow include the global cutting equipment market analysis – by equipment type, cutting technology, end-use, and regional/country level analysis. All the above sections evaluate the market on the basis of various factors affecting the market. Each section discusses the qualitative and quantitative aspects of the global cutting equipment market. To give a brief idea about revenue opportunities from the product type, end-use industry and region/country-wise segments, the report also provides volume (units) data, absolute $ opportunity, and total incremental opportunity for each segment over the forecast period. The final section of the report provides the global cutting equipment market structure and a detailed competition landscape with company market share and performance, to provide report audiences with a dashboard view of key players operating in the global cutting equipment market along with their business strategies. This section is intended to enable clients to assess strategies deployed by market leaders and help them develop effective strategies accordingly. For market data analysis, the report considers 2016 as the base year, and a comprehensive forecast made for 2017–2024. To calculate the market size, the report considers the weighted average price of cutting equipment based on cutting technology such as plasma, oxy-fuel, laser, carbon arc, and waterjet cutting technology across key geographies on a regional basis. To deduce market volume size, consumption of cutting equipment has been considered. In order to provide an accurate forecast, the report starts by sizing up the current market, which forms the basis of how the global cutting equipment market is expected to develop in the future. Critical market data including the base number and segmental splits has been devised through in-depth secondary research. This data is then triangulated on the basis of different verticals, considering both supply side and demand side drivers and other dynamics of the various regional markets, along with primary interviews of manufacturers and industry experts operating in the global cutting equipment market. The forecast presented in the report evaluates the actual use of cutting equipment and expected consumption in the global cutting equipment market over the forecast period. The report also analyzes the different segments of the global cutting equipment market in terms of basis point share (BPS) to understand individual segments’ relative contribution to market growth. This detailed level of information is important for identifying the various key trends governing the global cutting equipment market. The report also analyzes the global cutting equipment market based on the absolute dollar opportunity. However, from a sales perspective, it is essential to identify absolute dollar opportunity to identify potential resources in the global cutting equipment market. PMR has developed a market attractiveness index to understand the key segments in terms of their performance and growth in the global cutting equipment market. This market attractiveness index would help clients identify real market opportunities in the global cutting equipment market. Increasing demand for mechanized cutting equipment in fabrication is expected to be one of the major trends fueling growth of the global cutting equipment market in the near future. In developed countries, due to the shortage of skilled labor, the demand for cutting automation technology for fabrication and manufacturing purposes is on a rise. Major companies in several developed countries in North America and Europe have started using cutting robots for their manufacturing processes in order to reduce dependency on manpower. Increasing labor costs in turn increase overall manufacturing cost of products, especially in developed countries. This trend is also gaining popularity in some developing countries. 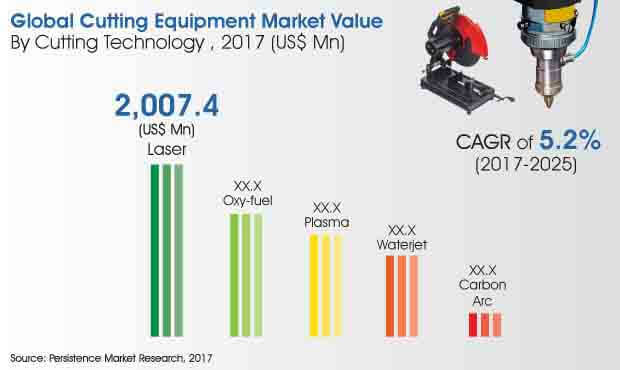 The global cutting equipment and consumables/accessories market was valued at above US$ 3.6 Bn in 2017 end and is expected to reach nearly US$ 5.5 Bn by the end of 2025, registering a CAGR of 5.2% over the forecast period. Rapid growth of end-use industries such as construction, automotive, shipbuilding & offshore, and manufacturing is expected to drive global growth of the cutting equipment market, especially in the APAC region over the assessment period. The oxy fuel segment is expected to reach a valuation of about US$ 680 Mn by 2025 end growing at a 2.4% value CAGR during the period of assessment. The report is a milieu of crucial information fetched through extensive research. Both primary and secondary research has played a crucial part in gauging the evolving market behavior within the forecast period. The global cutting equipment market is mature and each cutting technology type has its own specific qualities that makes it popular amongst the major end users present in the market. Oxy-fuel, followed by plasma cutting technology is widely used due to relatively low cost, high speed and precision cuts. Advanced cutting technologies like laser cutting are stable, reliable and known for excellent cut quality. This will open newer avenues of growth for the market even in regions that are presently not extensively using it. The market expansion of the global cutting equipment market is somewhat walled by high prices. Mechanized equipment is highly priced and most of the manufacturers are based across Europe and North America. The use of advanced cutting technologies is comparatively slow in the Asian markets. WB ALLOY WELDING PRODUCTS LTD.